Adult Gulf Fritillary butterfly nectars on the common-but-important Spanish Needles (Bidens alba). Photo by Sharon LaPlante. Beautiful colors, enchanting flight patterns, symbols of life and transformation — butterflies add magic to your landscape and fascinate visitors young and old. A butterfly garden will nourish not only the butterflies but also you, by providing a place to “get away from it all” and reconnect with nature. One reason butterflies are so fascinating is that during their lives, they pass from one very different-looking stage to another. Starting as an egg that may be as small as the head of a pin, the butterfly “hatches” as a caterpillar. This is referred to as the “larval” stage. A newly born caterpillar (larva) may look like nothing more than an eyelash or a piece of lint. 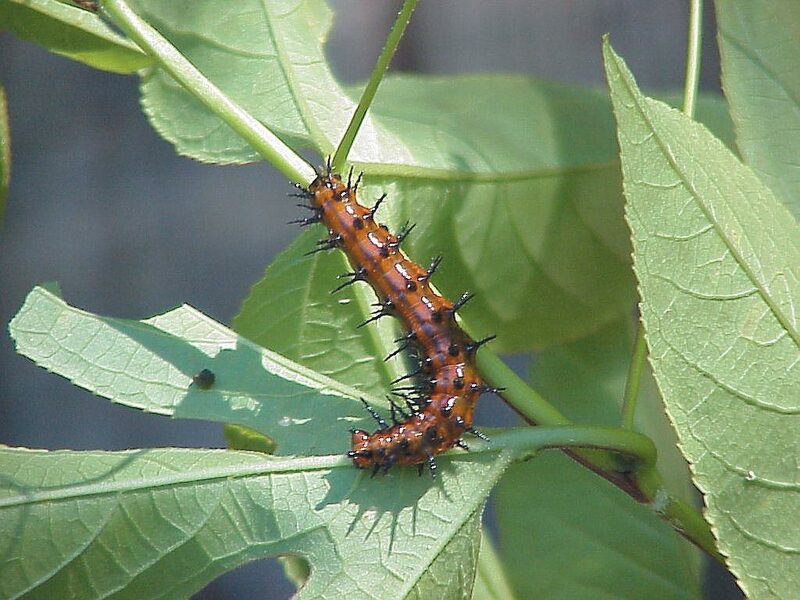 But if there are enough of the right plants nearby, the caterpillar will feed and grow quickly, changing color and size and shedding its “skin” (an exoskeleton) three or four times over a period of a few weeks. Once mature, the caterpillar will stop eating and crawl away to pupate, or form the chrysalis. Within a couple of weeks, the adult butterfly will emerge from its chrysalis, to start the whole process over again. 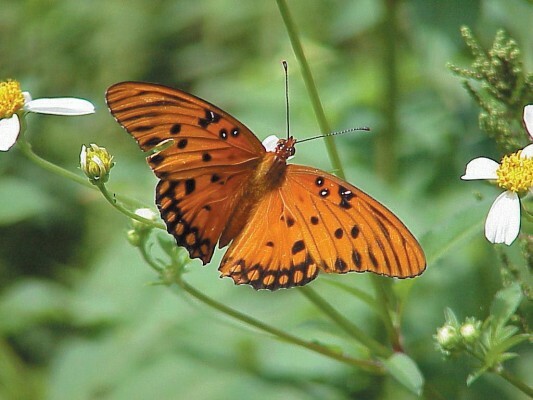 Florida has nearly 200 species of butterflies, some of which occur only here, nowhere else in the world. Wherever you live in Florida, there are probably several dozen species of butterflies living in your area. Take a few walks around your neighborhood to become familiar with the most common species. And take note of where you see them. You’ll discover that butterflies, like all other wild creatures, don’t live on turfgrass. You may be surprised to find the greatest number of butterflies in an empty field, full of “weeds.” A wide variety of native plants, including both trees and wildflowers, are used by butterflies. Juvenile Gulf Fritillary butterfly, in its caterpillar form, feeds only on three native species of passionflower: Maypop (Passiflora incarnata), Corky Stem Passionflower (P. suberosa) and Yellow Passionflower (P. lutea). Photo by Sharon LaPlante. Feeding butterflies and caterpillars. Gardening for butterflies focuses on selecting two kinds of plants: nectar plants for the adult butterflies and larval (or host) plants for caterpillars. Nectar, found in flowers, contains sugar, protein and other nutrients needed by adult butterflies. Butterflies will nectar on a variety of flowering plants, but not all flowering plants provide nectar. Your FANN native nursery will have a large selection of native nectar plants, both shrubs and perennials, perfect for your part of Florida. You can also find good nectar plants by searching for plants with butterfly wildlife usage on this website. Larval plants are those upon which female butterflies lay their eggs and caterpillars feed. Most butterflies are very selective and will lay their eggs on only a few species of native plants. If you want to attract butterflies to your yard and keep them there, you must provide the right larval plants for their young (caterpillars). You can find larval plants by searching for plants with caterpillar wildlife usage on this website. Remember that the plants and the butterflies have co-evolved over thousands of years. If caterpillars overwhelm your plant, it’s okay! Don’t be tempted to spray! Your plants will recover. Pick a sunny spot for your butterfly garden, and plant a variety of nectar and larval plants. Most nectar plants need at least a few hours of sun, and newly “hatched” butterflies use the sun’s energy to get their wings moving. Butterflies sleep under leaves so it’s a good idea to have some tall shrubs where they can roost. A few shady spots in the landscape will benefit butterflies like the zebra longwing, our state butterfly, which enjoys fluttering in the shade. Never use pesticides in your garden! You will endanger the health of your family and eliminate butterflies and many other creatures.